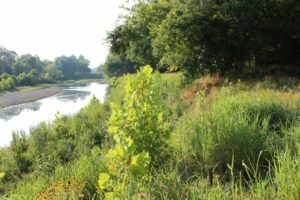 The Watershed Conservation Resource Center (WCRC) worked with project partners to stabilize a riverbank on the White River near Fayetteville, AR. 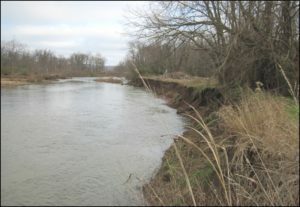 A stabilization plan was developed and implemented for the eroding bank which was contributing an estimated 3,600 tons of sediment per year to the White River. Beaver Reservoir is located only a few miles downstream of the project site. The project was funded by an EPA Section 319(h) grant administered by the Arkansas Natural Resources Commission with matching funds provided by the City of Fayetteville and other project partners. The project was initiated in January 2011, and implementation of the bank stabilization plan began in February 2012 and was completed in April 2012. The White River, located in Northwest Arkansas, eventually forms Beaver Lake, which is the primary drinking water source for over 400,000 people in Northwest Arkansas. The Arkansas Department of Environmental Quality placed the White River on the 1998 State 303(d) list of impaired waterways citing sedimentation and turbidity issues as a result of surface erosion, which includes streambank erosion, as the cause. The project is located on a section of the White River that remains on the impaired list in 2012. Measurement of the lateral rate of erosion at the project site stream bank indicates that the bank was retreating at a rate approximately 14 ft/year generating nearly 3,600 tons of sediment that contributes to high turbidity levels. The erosion of the riverbank also contributed nutrients to the waterway, potentially increasing the water treatment costs for human consumption. The WCRC utilized natural channel design principles to reduce streambank erosion and sediment loads. A toe wood bench was designed and constructed using large trees, boulders, and gravel. The structure known as a boulder and wood toe bench was built outward from the existing eroded bank with two distinct levels that allow flood waters to spread out resulting in lower velocity. Trees used in the structure were donated from an ongoing highway project nearby. 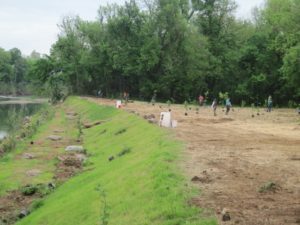 The edge of the bench, with exposed root wads and boulders provides excellent fish habitat and also reduces the power of the passing floodwaters. A portion of the river channel was excavated to offset the lost capacity that resulted from construction of the bench. The use of native vegetation is a critical component of the stabilization design. Soil mattresses, a soil layer consisting of topsoil wrapped in a coconut fiber blanket, were constructed on top of the two benches, provide a medium for plants to take root and grow and provide additional weight to secure the trees used in the structure. These soil lifts were seeded with a mix of native riparian seed types.Over 700 native potted plants including Alder, Witch Hazel, False Indigo, Blackhaw Viburnum, and American Beauty Berry and more were planted with help from volunteers. Several hundreds river oat plugs, and willow, sycamore, and button bush cuttings were incorporated. Maturing plants help to bind the structure through root growth and will also help to dissipate water velocity as the leaves, branches, and stems of the plants interact with flood waters. An irrigation system was designed and installed to help insure the survival of the planted vegetation during the maturation process the first two years. The restored bank provides water quality benefits almost immediately following construction. A flood took place one week after heavy construction was completed, and inspections conducted indicated that no erosion occurred along the previously eroding riverbank. Prior to this project, the same event would have resulted in significant erosion releasing several thousand tons of sediment into Beaver Lake watershed. But to ensure long-term water quality benefits, it is critical to establish healthy vegetation at streambank restoration sites.